Did you know… simple viral infections like the common cold, flu, and pneumonia cause major problems for folks over the age of 65? Now, you’re probably aware antibiotics are useless against viruses. Antibiotics only kill bacteria – not viruses. In fact, the Mayo Clinic reports overuse and misuse of antibiotics can lead to resistance to antibiotics and antiviral drugs. And even if you use antiviral drugs (the few that are available)… most are ridden with some of the worst side effects in medicine. So if Big Pharma’s drugs won’t do squat to knock out a virus, then what will? This helps you knock out that cold that just won’t quit, and there’s even sound scientific evidence that proteolytic enzymes can fight off disease. The first of proteolytic enzymes’ many talents is their ability to “eat up” the protective coating on a virus. The outer protein coating on a virus, called the capsid, protects the virus and helps it to attach to a host cell and multiply. This protective coating is part of what makes viruses so difficult to eliminate from your body. But not only do proteolytic enzymes rid a virus of its protective outer coating. They also boost your immune system, helping it to further rid your body of viruses, for an effective two-pronged virus-busting attack. 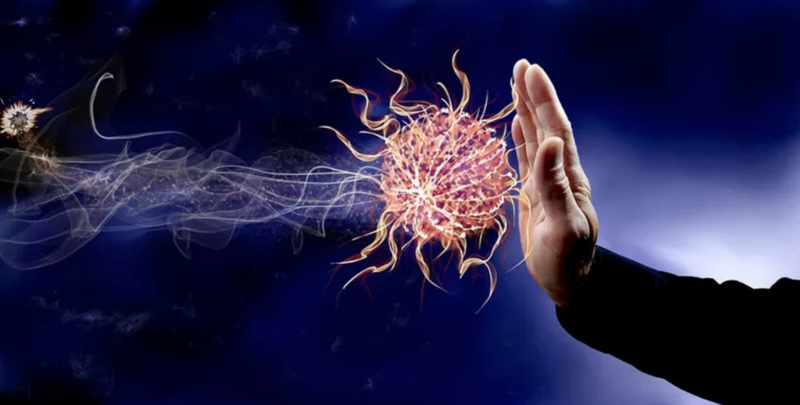 Your immune system – NOT pharmaceutical drugs – is your body’s #1 defense against viruses. You see, your immune system attacks viruses on multiple levels. For instance, immune system cells may attach to a virus directly to kill it before it enters your cells. If it makes it inside your cells, it can “flag” them so that your immune system’s T-cells can destroy it. Plus, once you’ve been exposed to a virus, your body remembers the virus so that if you’re exposed again it can quickly launch an attack to defeat it. And proteolytic enzymes are scientifically proven to stimulate and kick your immune system into high gear. So not only do proteolytic enzymes rid a virus of its protective outer coating, rendering it inert, they also boost your immune system, helping it to further rid your body of viruses. Yet, there’s a third way that proteolytic enzymes help you steer clear of bugs and viruses. And this might be the most important. You won’t read about this in any mainstream publication, or hear about it from your doctor. Yet, this is the “villain” hiding in the shadows that health experts say could be the #1 thing keeping you or a loved one from living a long, healthy life. Fibrin is that “sticky” scar tissue your body uses to help cover and heal wounds. It’s a natural part of your immune system. Fibrin can help make a scab on a wound, but it’s also used to isolate an injured area of your body. By isolating an injury, your immune system protects the area while using white blood cells and other proteins to fix the problem. Fibrin is sticky, strong and forms a very fine “mesh” that looks like a net. Fibrin on red blood cells. Under normal circumstances, fibrin is not a problem. But in our modern world, fibrin is overproduced. In most people, fibrin is a runaway freight train. This overproduction of fibrin doesn’t come from injuries, but from chronic inflammation caused by environmental toxins and highly processed foods. The fibrin “mesh” is so fine, it can trap red blood cells that deliver oxygen. Over time, excess fibrin acts like a web which BLOCKS blood flow and traps red blood cells, preventing oxygen from reaching tissues and waste from being removed. What is the link between fibrin and dangerous viral infections? 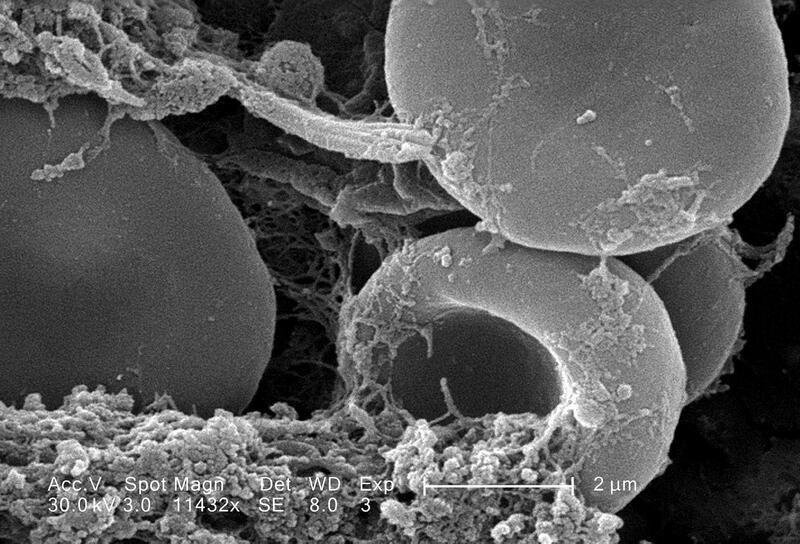 Viruses and bacteria HIDE under the fibrin layer coating the blood vessel’s walls. Not only does this hide them from antibiotic and antiviral treatments… but it makes it harder for your immune system’s white blood cells to “seek and destroy” nasty viruses. Studies even show cancer cells often hide beneath this extra layer of fibrin. This is where proteolytic enzymes come to the rescue. Proteolytic enzymes naturally dissolve excess fibrin. And like rats abandoning a sinking ship, those viral cells scurry out into the open. Your immune system goes to work and kills these nasty bugs. Proteolytic enzymes are your body’s only defense against excess fibrin hiding viruses and bacteria. Now, proteolytic enzymes are naturally produced in your pancreas. But your natural production of proteolytic enzymes declines with age. It starts to go down around age 27. And by age 40, your proteolytic enzyme production drops off a cliff. And to make matters worse, studies show our modern environment – a “toxic soup” of chemicals, toxins, and heavy metals – is also causing our proteolytic enzyme levels to plummet. And it’s nearly impossible to replace your store of proteolytic enzymes through diet alone, even with a diet of only healthy, organic foods. But you can safely and easily replace them through supplementation. And unlike many vitamins and drugs, you literally cannot get too many enzymes. There are a few proteolytic enzyme supplements on the market. But you can get the world’s most potent proteolytic enzyme supplement right here at the Healthy Back Institute®. Click here to learn more about how Heal-n-Soothe® can help you. [i] Encyclopedia of Life, What is a Virus? [ii] Encyclopedia of Life, What is a Virus? [iv] Environ Sci Technol. 2012 Nov 6;46(21):12069-78. Tried it, very good products, But, the market promo,looks like reap- off. E.g,buy 3 get 2 free, you are realy paying for total of 5 ( whole), not even 1/2 off. Very expensive product. Pls.consider the snr.citizens who lives on pension now!To invest #300+ on a product from pension,no payments plan?. In fact, we do offer a monthly payment program that allows you to simply buy one bottle per month and still save. Have you heard if this product is killing and enabling the immune system to totally eradicate the body of herpes virus? However, since herpes is a virus, and proteolytic enzymes are used by your body to break up the fibrin coating viruses like to hide behind as discussed in this article, it may help and can’t hurt. Is the herpes virus brought by chicken fox the same Kind OF those being referred to viruses OF sexually transmitted disease referred to by China study with the suggested cure? Chicken pox is not the same as the sexually transmitted herpes viruses, but it is one of the over 25 known types of herpes viruses – specifically, Varicella-Zoster. Again, we can’t give specific medical advice however both enzymes and colloidal silver are powerful tools in the natural health toolshed for fighting viruses of all kinds! Another great natural remedy for viruses I just recalled – especially helpful for flu, but might be helpful for chicken pox (not sure) – is black elderberry syrup. Sambucol is a brand trusted by our family for that. Question: can one experience “die-off” symptoms when taking proteolytic enzymes? I hope I’m having “die-off” symptoms. I am taking Heal & Soothe for muscle pain in my legs… and it seemed to help at the beginning but I am in the second month… and even though I upped the doseage, my legs are in such pain I can hardly walk. Is this normal? is it going to get better? Mary, can you please be more specific when you say die-off symptoms? are you taking Heal n Soothe now and are you experiencing some symptoms? Is there any way I can make the enzymes at home all by myself with sprouting grains, or something, as I have no money. Thank you. I believe that increasing your consumption of fermented foods (sourkraut, kefir, kimchi, buttermilk) will have much the same effect. When will this be available in Canada. I am going to las Vegas next week how can I get some.? 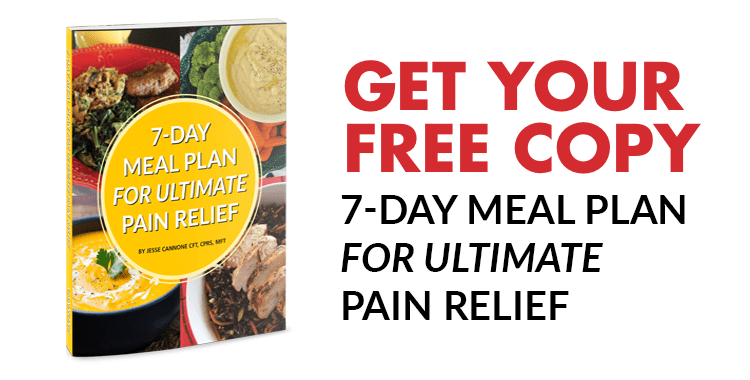 Could this product help with neuropathy or sciatica? I have had burning, tingling in feet and other areas for over 7 years. 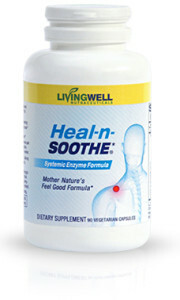 Lynn, We can ship up to 3 bottles of Heal n Soothe to any one customer in Canada. There is a product called NeuroQuell that is pretty effective made by Health Assure. Glenn, For the most part, systemic enzymes help restore and support the bodies immune response to an injury, so I can not give you a specific answer as to the degree of success you would feel taking systemic enzymes for peripheral neuropathy. this is Terry Lynch and I live in PORT Noarlunga here in South Australia -and the few orders I have made for a variety of their products; have easily been delivered to my home address. Sure the getting here to Aussie does take a bit longer, but each one has arrived -and the next order(paid today online) will as well. Cheers, Terry. -and just get the order approved/paid and it will arrive for you. Hi all, Is the product enteric coated as stomach acid might destroy the enzymes would it not? Good morning…I have been a customer for a while…(I have used Rub on Relief) and actually ordered a three month supply of Heal n Soothe…but I was taking antibiotics (for several months) to treat Lyme Disease, so I never ends up using the product (it mentioned somewhere about not using in conjunction with antibiotics I believe?). At any rate, I kept the bottles under refrigeration and would like to give this a try. I understand that they may be less effective, but I read that they are fungal sourced, so would they be harmful to take? It had been several years (I would have to check the expiration date), but it was (and is) a significant investment and I’d like to know. I have learned a bit more about my health and genetics since then…Do y’all offer over the phone consult about products or is this the best way to ask questions? Thank you! Glad y’all are still around! 1. Correct we do not suggest or support the use of Heal n Soothe while taking antibiotics. can this helps to cure my pain and swollen angle??? I have gout and arthritis in my ankles and big toe as well as a lumpy type of gout in my index finger. I cannot take anti inflamnatories I am told because of low kidney function. Will this product help these problems and also if I take it will my kidney function deteriorate? It is the job of systemic enzymes, the very enzymes already in our bodies that help support immune function, but when things get out of balance and the body does not have what it needs, people get stuck… Heal n Soothe use those very same enzymes in order to help rebalance your systems and in turn supports the bodies ability to recover. Would this product help with the swelling in my legs. I’ve had every test to figure out why this is happening, but still know answers. I’ve had this problem for the last ten years and I’m on two medications to help rid my body of excess fluids. I’d like to get off of them and find a more natural way of dealing with the issue. Can this help? Pauline, While we know of no reason why you could not take them, we have to ask you to consult your physician on the matter as only they know your complete medical history and only then can make that determination.